Korean cuisine, with a new focus of "Back to Tradition," has entered the spotlight among the Korean younger generation and become a favorite choice for people around the world. Reflecting this trend, YURA, authentic Korean restaurant at Novotel Ambassador Doksan, is offering a special lunch promotion with over 50 fresh Korean dishes available to order at an affordable price of 25,000 won. The special lunch features 50 delicacies, which are prepared freshly upon request. The fare on offer includes soups such as Beef Rib Soup, Spicy Beef & Vegetable Soup and Beef Knee Bone Soup. Also on the menu are fish & meat dishes including Grilled Salmon, Grilled Beef Sirloin and Marinated Chicken. 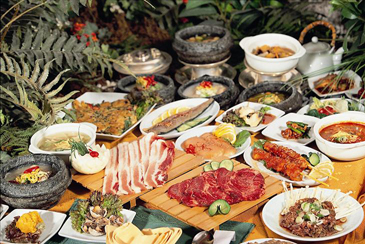 A set of uniquely Korean dishes including Mung-bean Gruel, Squash Porridge of Pumpkin, Conch Shell Porridge, Vegetable Bibimbap, Steamed Rice with Mixed Vegetable, Buckwheat Noodles in Cold Soup Broth, Buckwheat Noodles and Vegetables and more are available. Seasonal fruits and Korean traditional desserts round off the menu. Known for its modern and luxurious interior touch, "YURA" has been favored as an establishment for family gatherings and business meetings. The special lunch promotion "All-You-Can-Eat" is a great opportunity for foreign visitors in Korea to sample an array of the cusine the country has to offer. The special lunch will be available through the end of the year.